We, the international students, held the International Festival on December 7th. We introduced each country’s culture to students and professors by serving traditional foods and showing performances. We had really a great time! For more information about the International Festival, see the article in the Castleton Spartan newspaper. Four Castleton University international students were among the hundreds of ski volunteers at the Audi FIS Women’s Ski World Cup at Killington Ski Resort over Thanksgiving weekend. Li, who is pictured in the photo on the left all the way to the right, and Oskar, Paul and Anton seen left to right in the photo on the right, were on the race course crew. 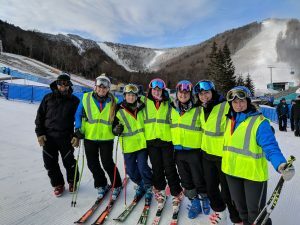 These goodhearted students spent their Thanksgiving break working from dawn to after dark slipping the slalom and giant slalom courses on Superstar trail where the world’s best female ski racers from 20 countries competed. In addition, they built inflatable walls (and took them down) around metal objects (e.g. chairlift towers) to protect the ski racers from injury in case of a crash, of which there were a few. These students know from personal experience what ski racing is all about, being members of the Castleton alpine team. They are excited to hit the slopes themselves and start training for their first race on January 12, 2018 at Okemo Mountain. Everyone did an amazing job, as I heard so many good things about Paul, Li, Anton, and Oskar from various folks who were also volunteering, said Castleton’s Alpine Ski Coach, Chris Eder, who also volunteered his time to work 12+ hour days to help with the course. Sign-up below to be notified by email when a new post is published!